No heat was detected by the MODIS satellites over the Soberanes Fire last night. 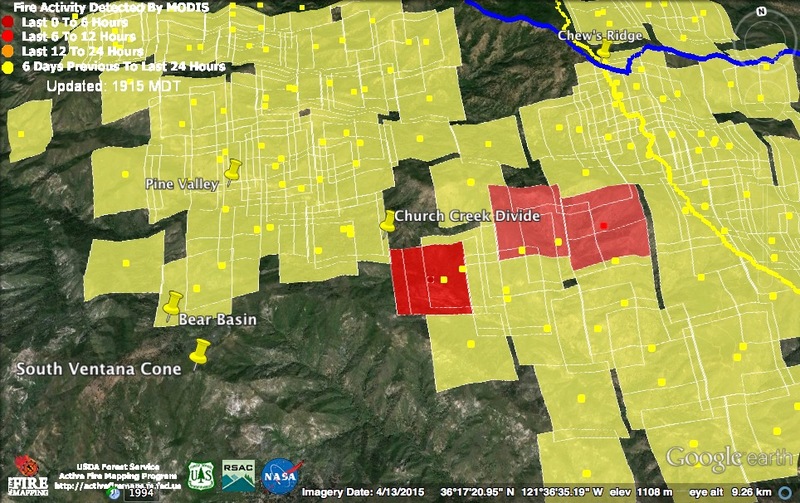 This morning’s infrared map, based on data acquired around 10:00 pm last night, indicates that the remnants of the Chews Ridge firing operation continue to work their way through pockets of unburned fuel, mainly between Church Creek and the Tassajara Rd. Full containment of the Chews Ridge slop over has still not been declared, but it is not expected to cause further problems. The Soberanes Fire, exclusive of the Chews Ridge firing operation, has not expanded its perimeter in the Carmel River watershed in almost a month now, and it’s been about two weeks since there was any expansion at the fire’s far southern end (now declared contained). As there is now very little chance of the residuals of the firing operation escaping containment, it is probably safe to say that, other than interior burning – which could conceivably go on for months, the Soberanes Fire is nearly over. Even with the more than 20,000 acres added by the Chews Ridge firing operation, it now appears that the Soberanes Fire will not come close to matching the size of the Basin Complex (163,000 acres) or Marble Cone (178,000 acres) fires. Contrary to popular belief on social media, it is not, and is quite unlikely to become, the biggest fire in Monterey County, much less State of California, history (a title held quite securely by the 315,577 acre Rush Fire). The Soberanes Fire is, for the record, currently the 18th largest fire in California since record-keeping on such things began. Current official numbers: 128,380 acres; 81% containment. 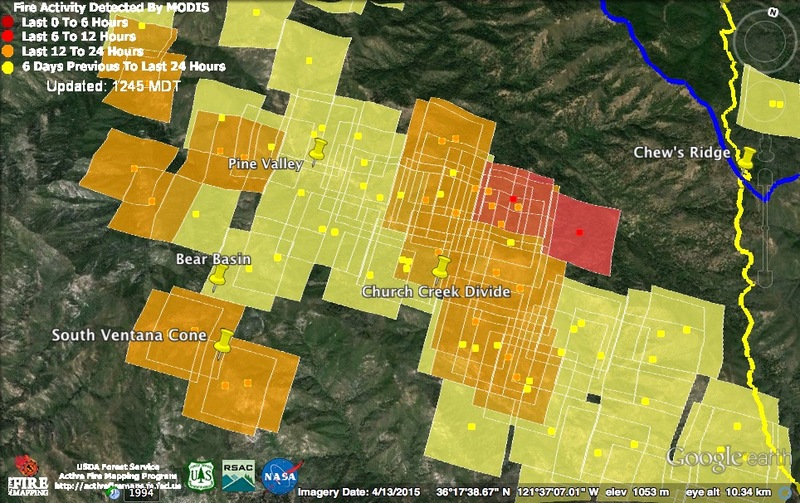 The 3:00 am MODIS satellite found heat on the ridge east of Chews Ridge, above Miller Canyon. The 11:30 pm infrared scan also found heat in this area. The entire southern end of the fire, from the Coast Ridge across the Lost Valley and Willow Creek watersheds is now considered contained, and the perimeter from that point north toward South Ventana Cone, which has been equally quiet, may well be declared contained in the near future. Beyond South Ventana Cone, the Chews Ridge firing operation has been bumping up against areas already burned and numerous pockets of burning remain. There remains uncontained fire outside the containment lines in the area of the Chews Ridge slop over, but the Forest Service seems to believe they have a handle on the situation there and will soon be able to declare the slop over fully contained. Assuming nothing rekindles along the contained line and the Chews Ridge slop over does not escape, the only opening that remains for the fire to escape containment is in the Arroyo Seco area. To get there, the fire would have to burn down Tassajara Creek to the Arroyo Seco River. To prevent this, firefighters are now building direct line along the fire perimeter in Church Creek, just upstream of Tassajara Creek. Today is hotter and drier than yesterday, but with much less wind. A slight cooling trend may begin tomorrow, but it will still be exceptionally hot and dry on the fire lines. Current official numbers: 127,478 acres; 78% contained; 57 homes and 11 other structures destroyed; 1 fatality; 8 injuries. Hot weather and low humidity got the fire from the Chews Ridge firing operations cranking again today. That fire is now in the process of chewing through previously unburned areas (like the ridge west of Chews Ridge and South Ventana Cone) deep in the Ventana Wilderness. These heat detections were acquired around noon (light red squares) and 1:30 pm (dark red). Judging by the smoke, the fire got considerably more intense as the afternoon wore on. The Forest Service announced yesterday that they have changed their minds and will not continue firing operations down the line toward Arroyo Seco. Instead they say they plan to go direct from the Tassajara Rd. which, presumably, means building hand line along the southeastern edge of the fire in Church Creek and beyond to prevent it from reaching the Tassajara Zen Center and, eventually, Arroyo Seco. 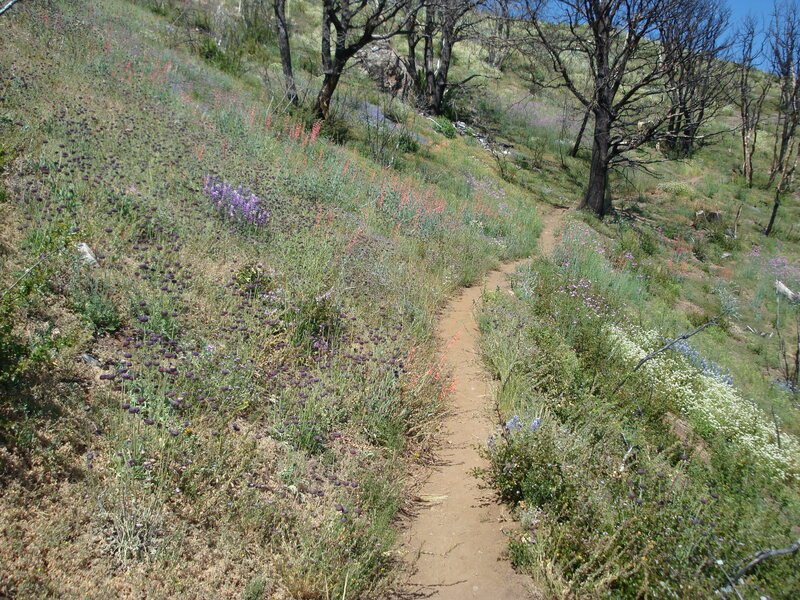 With the slop overs all but out, the Chews Ridge firing operation has now succeeded in creating thousands of acres of black along the Chews Ridge containment lines, but the stated objectives of keeping fire west of the Carmel River, of burning out only a “perimeter,” and not igniting “all the unburned vegetation inside the Ventana Wilderness” have clearly been a failure. The firing operation has consumed thousands more acres than the Forest Service originally intended it to, and it is still moving forward through unburned Wilderness as I write. This, together with the difficulties caused by the spot fires outside the line during the past week, may have convinced the Forest Service to abandon the firing strategy in favor of going direct. Current official numbers: 126,693 acres; 77% contained. The MODIS satellites failed to find heat anywhere in North America today, so it is probably safe to assume that the system is down. The good news is that the Forest Service confirmed today that the English Cabin and the structures at the Church Ranch were saved. 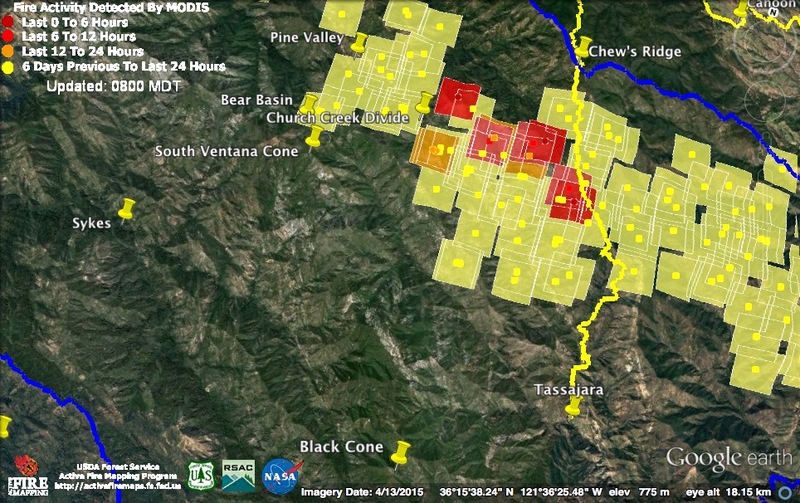 Satellites at around 11:00 pm (light red squares) and 3:00 am (dark red squares) found continued heat in the high country west of China Camp and the Tassajara Rd. There is no sign of the fire having advanced further toward the Tassajara Zen Center or Arroyo Seco. This morning’s infrared map also finds some patches of intense fire in that area. 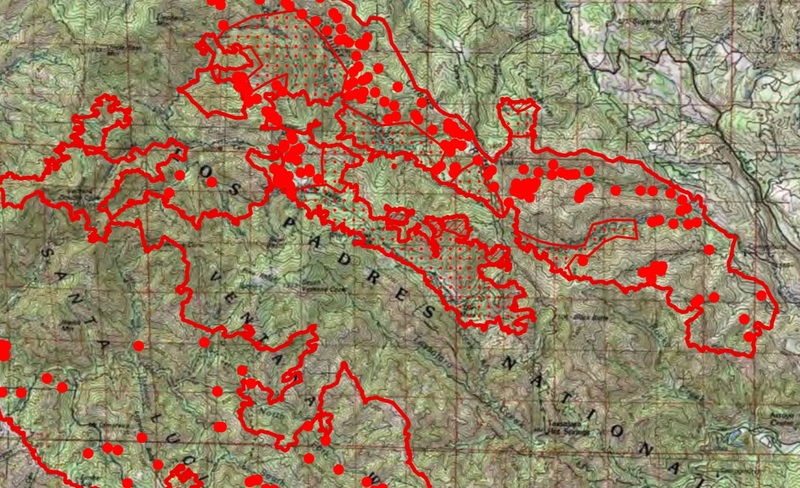 It also finds active fire in the Chews Ridge slop over, but less than on yesterday’s map. There’s no telling exactly when this scan occurred, as the map maker forgot to update the date and time (which remains the same as yesterday). While a red flag fire warning will be issued at 9:00 pm tonight for the hills north of San Francisco, due to expected strong, dry winds, those winds will not make it this far south. Here, northwest winds of 10 to 15 miles per hour, with gusts to 20 mph, were blowing over the fire early this morning. Wind is expected to decrease slightly this afternoon, turn to the south tonight, and turn to the southwest, by tomorrow afternoon, increasing slightly. Today should be fairly hot and dry, but tomorrow and Monday are expected to be seriously hot and dry, with single-digit relative humidity. 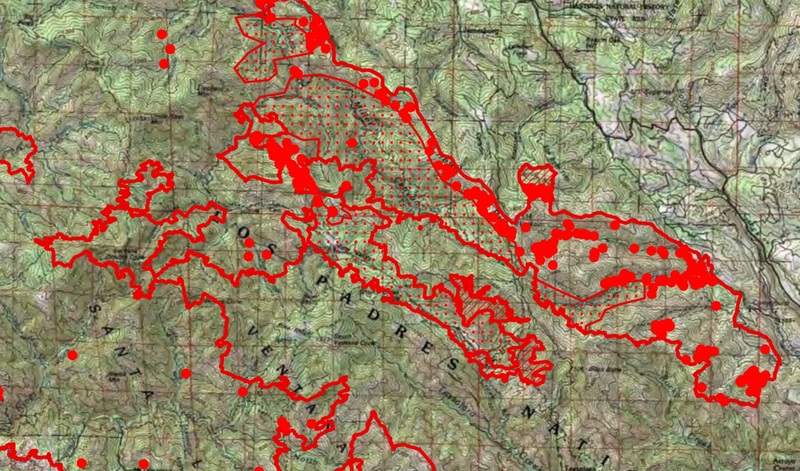 Today’s infrared map puts the size of the fire at 126,593 acres. Today’s satellite passes were close together. Around noon (light red squares) and 1:30 pm (dark red squares). 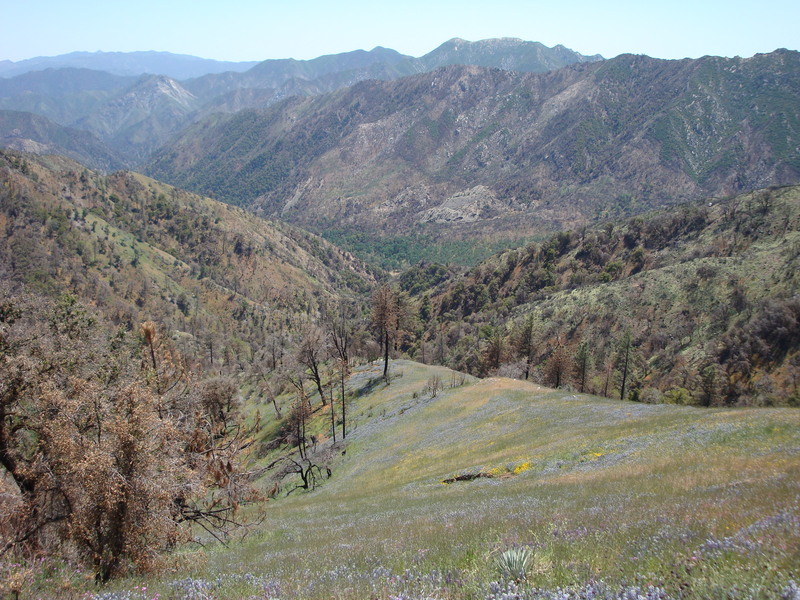 The only fire hot enough to be noticed by the satellites was burning in the high country on the Tassajara side of the Church Creek Divide. 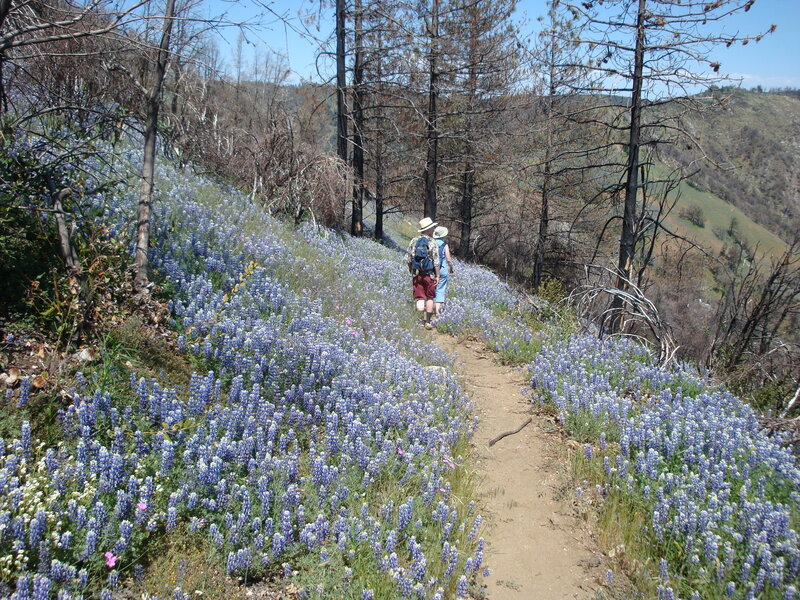 Repeated fires have been hard on conifers in the Santa Lucia mountains, but they do make for spectacular wildflower displays. 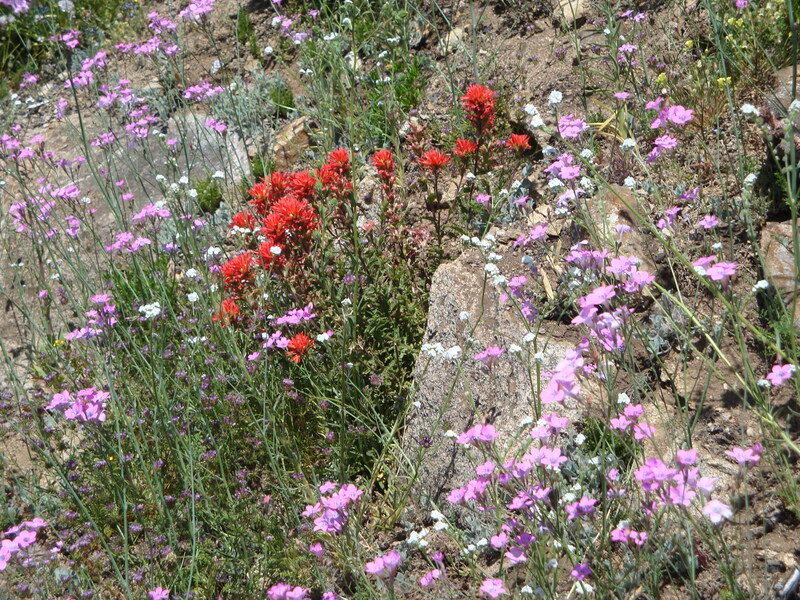 Lots of chia and penstemon (among many other things) growing under burned trees. View into Church Creek. Wednesday night, the fire blew over the Church Creek Divide (off to the right), then ran down the floor of the Church Creek Valley through this picture. It has since climbed up the slope and today was burning in the area where this picture was taken. Current official numbers: 126,323 acres; 73% contained. The MODIS satellites failed to find any heat on the fire last night, but they also failed to find any heat anywhere in the Western US south of Seattle, so it’s probably safe to assume the MODIS system was having some problems. This morning’s infrared map, based on a scan that occurred around midnight, found continued intense heat within the Chews Ridge slop over and at the business end of the fire along Church Creek. The Forest Service says they are building direct line around the Chews Ridge slop over. Whether or not they are also building the new indirect dozer line proposed in the area they haven’t said. There has been no official word on the fate of the English Cabin or the structures at the Church Ranch (although there is a Forest Service video saying the Church Ranch was saved by backfiring). There were many rumors yesterday that crews are now prepared to backfire from the Tassajara Zen Center, should the fire get too close. The Forest Service hopes to resume firing operations on down the containment line to Arroyo Seco soon. A significant warming and drying trend will begin today. Winds, fortunately, will remain light. This morning’s infrared map puts the fire at 126,323 acres. In recent days, videos posted to the Los Padres National Forest Facebook page have become one of the better sources of information on fire activity and Forest Service plans. Far more detailed and helpful information is often revealed in these videos than can be found in the official updates. Check it out. This entry was posted on Friday, September 23rd, 2016 at 7:55 am and is filed under Big Sur, Fire, Flood & Apocalypse, Santa Lucias. You can follow any responses to this entry through the RSS 2.0 feed. You can leave a response, or trackback from your own site. *Sigh* Week 10. Until the rains come …. Thanks for the tip re Los Padres FB page. We’ve also noticed the improvement in info there. Some helpful (if rather self-serving) videos. Let’s hope the rains come early, and often! 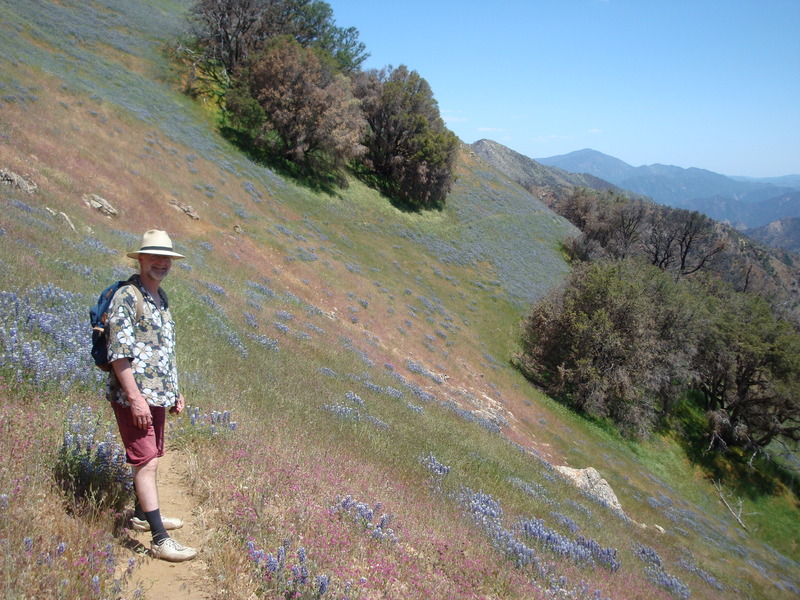 As a former resident at Tassajara (and firefighter) I am keeping a close watch on the Soberanes fire and this blog is the most detailed, hands down.